Among the renowned Siva kovils which emerged in various parts of Ilankai, Munnicuvaram kovil at Cilapam in the western part of Ilankai was prominent and extolled as a kovil of great antiquity. The presiding deity is called Śrī Munnainathar ('Lord of antiquity') and the goddess is Sri Vativampika Devi (‘goddess of beautiful form'). Munnicuvaram being a great Saiva shrine became a centre of highest devotion where people of various categories paid homage to the presiding deity. Thus this is extolled as a sacred site (punya ksetra), and renowned for its murti, ('deity'), sthala ('sacred place'), and tirtha ('sacred ford') aspects. The royal patronage to the kovil of Munnicuvaram continued until the 16th century, and during this period another ruler of Kotte Parakramabahu IX (1509-1528 A.D.), donated extensive lands to the kovil by recording in a copper plate inscription. 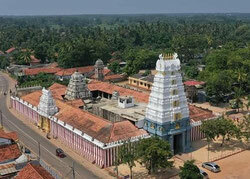 [v] It records his visit to this kovil and the endowment. The rise of Portuguese power in the Kingdom of Kotte in the 16th century led to the downfall of this kovil. The Portuguese soldiers caused a complete damage to this flour­ishing kovil by razing it to the ground in 1578. [vi] This seems to be a common incident in the history of the most of the leading kovils in Ilankai. Whenever these kovils met with devastation or damage by any force, the kings, priests and people with great devotional spirit engaged themselves in restoration activities and caused the regular kumbhabhiseka to be held accordingly. The renovation activities and the consecration ceremonies are said to be the special features in the history of the kovils. The devastated Munnicuvaram kovil was renovated in the eighteenth century by the Nuvaran King Kirti Śrī Rajasinha (1747-1782 A.D.) and the kumbhabhiseka ceremonies were performed in the year 1753. For the regular per­formance of the daily and special rituals of the kovil, he made a grant of extensive lands to the priests of the kovil, through a copper plate in the same year. 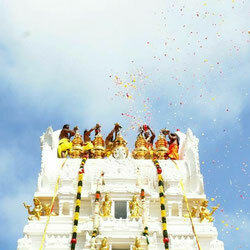 [vii] The maintenance of this kovil later became the responsibility of the priests. N. Coomaraswamy Kurukkal (1816-1909 A.D.),[viii] who was a leading priest attached to this lineage of priests of this kovil, took a great initiative to renovate the main sanctum (garbhagrha, 'womb-house'), the main hall (mahamandapa), and the semi-hall (ardha-mandapa) and performed the consecration of the kovil in 1875 A.D.
During the period of M. Somaskanda Kurukkal (1886-1940) of this kovil, a kum­bhabhiseka ceremony was held under his guidance and leadership in 1919. It is appro­priate here to mention about the priesthood who were the custodian of agamic tradition and we can mention the contributions of M. Somaskanda Kurukkal as an example. He was well versed in vedic and agamic texts, paddhatis (ritual manuals), grammar and philosophy. He possessed a good knowledge in the fields of silpa-texts and was familiar with the prescriptions of image-making. He was an exponent in performing the special rituals in kovils and widely performed kumbhabhiseka in the major kovils in Ilankai. He had travelled widely in India and witnessed the kumbhabhiseka rituals performed there. He had initiated fruitful discussions with the priests versed in agamic ritual traditions. It is worth to mention here that during this period, he contributed by holding the position of chief-advisor (sarvabhodaka, 'one who is skilled in all the rituals'), in the kumbhabhiseka ceremony held in Śrī Meenakshi Sundaresvara kovil. This is a clear inci­dent which shows that the agamic traditions were prevelant in kovils both in South India and Ilankai. In analysing these historical events in this kovil, we can say that this kovil has stood as a centre for maintaining the Saiva traditions and agamic ritual systems. Also we are in a position to know the lineage of the priesthood that has contributed to the de­velopment of this kovil tradition. The kovil that faces to the east consists of three pathways around it. A sacred pond is situated in front of the kovil and a Bo-tree stands by the side of it, glorified as the tree of the kovil (sthala vrksa). The main sanctum here is the one which is largest in comparison to other kovils in Ilankai, and finial in the structure above the sanctum (vimana 'the one which is well measured') is also large in proportion. The various architec­tual aspects of this kovil conform to the prescriptions laid down in the agamas. Siva linga is installed in the main sanctum of this kovil, which is also large in size. Siva as the undivided causal principle is worshipped in the linga. His more manifest as­pects are represented in various other images. The linga represents the male aspect and the pitha as a yoni represents the female principle complementing the male principle of linga; both together reflect the Siva-Sakti concept. In Saiva tradition the linga is the most sacred and highly venerated object. Hence Siva linga is installed in the garbhagrha 'womb-house' of any Siva kovil. The daksina murti ('the god facing the south') is installed in the southern direc­tion of the outer wall of the main sanctum, the sculpture of which is one of the best pro­duction of a skilled artist. The lingodbhava murti ('the god manifests in the linga') is enshrined in the western wall of the main sanctum. A separate shrine is dedicated to Sakti who faces to the south. Separate shrines are allocated for the surrounding deities (parivara devatas), such as Vighnesvara (‘Lord of Obstacles'), Murukan, Turk­kai (Durga: 'Goddess who is difficult to transgress'), Visnu and Bhairava (‘terrific form'). Candesvarar is installed in an independent shrine in the northeast of the main sanctum. Lord Nataraja ('Dancing King') is in bronze idol enshrined in a separate hall. A kovil for the nine planets (navagraha) also finds a place in the hall adjoining the sthambha mandapa (flagstaff hall). Another special aspect to be mentioned is the installation of the bronze icons of 63 devotees of Siva (Civan-atiyars), in a shrine room. There are other forms of Siva: Candrasekhara murti,(the god with the crescent moon as the ornament in the hair'), Bhiksatana (‘roaming beggar'), and Somaskanda ('the god with Uma and Skanda), in bronze are installed for worship. (flagstaff hall), vasanta-mandapa (spring hall), and yaga-sa1a (sacrifice hall), reflecting the architectural aspect of this kovil. There are six daily worships (pujas) held and vari­ous special rituals are performed according to the agamic prescriptions.